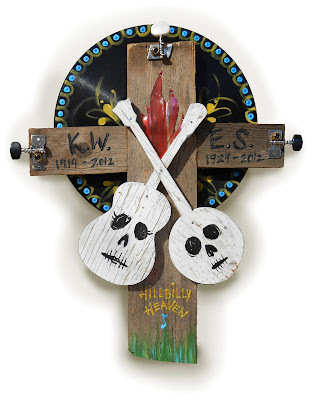 In keeping with my love of music and efforts to keep things Light and Bright, I have crafted a piece to honor Kitty Wells and Earl Scruggs, two souls who passed on this year. 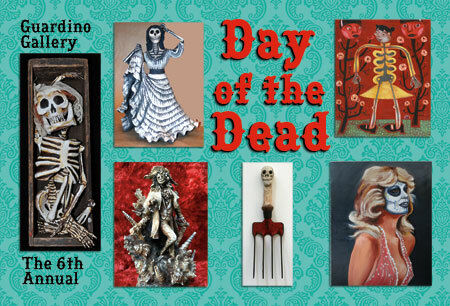 Day of the Dead is celebrated over 2 days. In most regions of Mexico, November 1 (All Saints Day) is to honor children and infants and is generally referred to as Día de los Inocentes ("Day of the Innocents") or as Día de los Angelitos ("Day of the Little Angels"). November 2 (All Souls Day) as Día de los Muertos or Día de los Difuntos: the commemoration of all the faithfully departed. 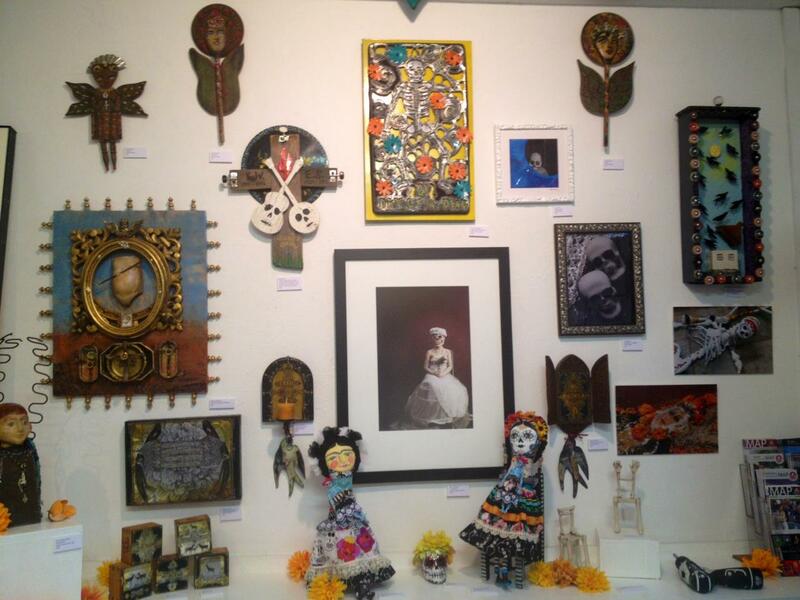 Dia de los Muertos is a major influence behind the work that I do. It took a series of events to get me here, but I am finally finding my way to my art through a process of healing and personal transformation. My path as an artist has taken many twists and turns, including long periods of denial, avoidance, rebellion and pent-up blockage (eww gross!). It's taken me a long time to get to a place where I can openly call myself an 'Artist' and feel it in my bones without too much fear or doubt. By the time I finally made it to Art School, I was already in my 30s! It was fun while it lasted, but then after I graduated, I stopped. I didn't paint or draw for 10 years! I got married, bought a house and had a baby. By the time my son started Kindergarten, I was feeling the pull to be creative again in a painfully powerful way. Our school was holding a Holiday Craft Bazaar and I brazenly signed up for it. The Bazaar was being organized by Local Crafty Maven Jen Neitzel (a Holy Craft Goddess in my eyes) and when she asked me what I made I could only answer "I don't know yet". It was on my bike ride home that day, only a few minutes after signing up that it hit me like gang busters! The Bazaar was scheduled for the first Saturday in November; Day of the Dead. I would make Sugar Skulls! My own mixed-media, recycled interpretations of them. -It felt like Divine Inspiration exploding in my gut. It had been almost exactly one year since the horrific tragedy that took 3 of our friends, a mother, father and daughter. We had been mourning their loss and silently suffering the aftermath. All of the sudden I saw a way to process all the hurt and transform my loss through a creative art form. I would make sweet, colorful, whimsical, wonderful sugar skulls and smite death with a smile! But even more special, I was given the amazing opportunity to create an altar in the window of Fantasma on Alberta. It was an incredible honor and gift to be able to create a very meaningful homage to our dear sweet friend Ruby. It was a healing experience for my entire family. That year (2009) we celebrated Day of the Dead like never before. There was a beautifully haunting procession on Alberta that night as we made our way up the street to the Guardino Gallery to see their annual Muertos Show. We left a message for Ruby on their altar. It has been a secret dream of mine since then to someday be in the Day of the Dead Show at Guardino Gallery and guess what . . . I hope you will visit this very special show, up until November 18th. Past, Present, Here and Gone. Thanks Alea, How special. It is a struggle to be a artist and the so many other things us mothers have to do. I remember that Altar at Fantasma. The procession was so great, we worked hard to make that happen. And the old Altar I built, so many great memories. Glad you were apart of it.Thanks for sharing!